Oversize pegs are easy for little fingers to grasp and stack on the board and each other to build towers while stacking. SATISFACTION GUARANTEED We offer superb educational toys and excellent customer service! If you're not totally satisfied with your purchase we also offer a Risk-Free, No-Questions-Asked, 100% Money-Back Guarantee! FINE MOTOR SKILLS DEVELOPMENT: The pegboard stacker set is great for building fine motor skills, hand eye coordination, develop and strengthen visual perception skills, visual motor coordination, making patterns & more! GAMES FOR TODDLER: Use with your child for sorting, color recognition, patterning, learning basic math skills such as counting, adding, subtraction and graphing. The best part about this Montessori set is that your little ones won't even notice that they are learning as they "play". 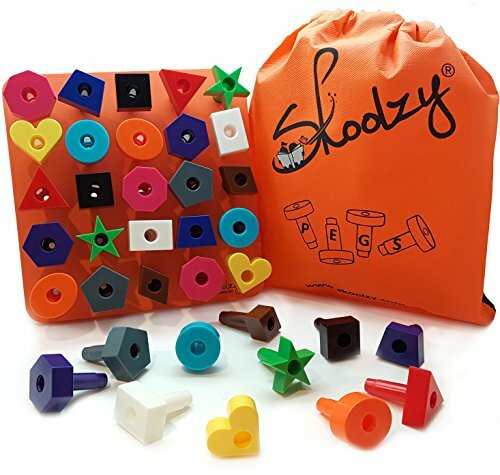 EASY STORAGE & TRAVEL MONTESSORI TOYS: It comes with the Skoolzy drawstring backpack to easily store all the pieces and for your child to carry their peg board set at home, in the car or airplane.. Makes for quick and easy clean up. This pegboard toy is a Montessori based fine motor skills toy that is loved by occupational therapists, parents and children alike! Use with your child for stacking, shape identification, sorting, color recognition, patterning, basic math skills such as counting, adding, subtraction and graphing. The best part about this set is that your little ones won't even notice that they are learning as they "play". The pegboard stacker is great for building fine motor skills, hand-eye coordination, develop and strengthen visual perception skills, visual motor coordination, making patterns & more! An occupational therapy staple for children and gifts. Use the peg toy with your child for sorting, color recognition, patterning, basic math skills such as counting, adding, subtraction and graphing. The best part about this math toys set is that your little ones won't even notice that they are learning as they "play". Comes with pattern card with 8 different patterning activities!